When you go on vacation, the last thing you want to do is leave your favorite four-legged family member at home. We know that one of the most dreaded questions travelers with furry friends are faced with is what do we do with our pets? 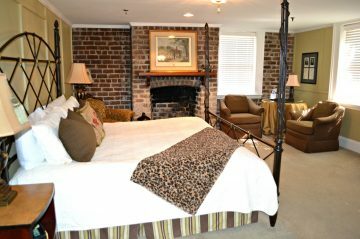 Luckily for you, Presidents’ Quarters Inn is one of the best pet-friendly bed and breakfast in Savannah, GA! Small dogs of 30 pounds or less are allowed at Presidents’ Quarters Inn. A deposit of $50 is required, and your canine companion must well behave! As long as you comply with our pet guidelines, we’ll have no problem with an extra furry guest. 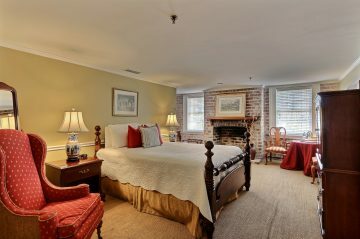 Have the trip of a lifetime when you bring your four-legged friend with you to Presidents’ Quarters Inn! Browse our pet-friendly rooms below. We’re more than happy to tell you the pet-friendly activities you can do in the city! 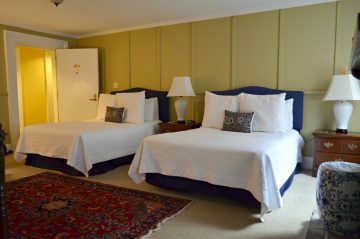 This room features a king bed, comfortable seating, and newly refurbished bath featuring retro black and white flooring and granite countertop. This room features a brand new bath with granite countertop and black and white retro flooring. 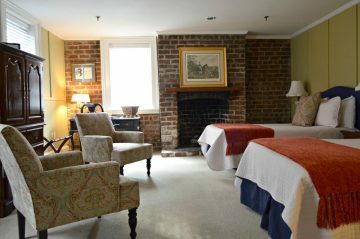 A cozy choice for Savannah bed and breakfast lodging is a courtyard room at The Presidents’ Quarters Inn.